Use this tech-savvy vintage typewriter as the keyboard for your tablet or phone. Think back, do you remember the last time you used a typewriter? Do you recall the resonant click clack of the keys as you plugged in every letter, eventually forming words, sentences, paragraphs, even whole manuscripts? What about the delight you felt sliding the carriage back into place with a zip and ring whenever it was time to start a new line of copy? Even a tech fanatic can admit that there was something uniquely exciting about using a typewriter that you just can't replicate typing into a smartphone, an iPad or a computer. The thrill of using a typewriter may be passing from memory, but Jack Zylkin's groundbreaking innovation brings this mechanical marvel out of retirement and offers a nod to its influence on the development of modern automation. For ardent admirers of the look, feel, and robust quality of an old-fashioned manual typewriter, the USB TypewriterTM allows you to use this once obsolete tool as a keyboard that plugs into any USB-capable device, such as your PC, Mac, or even your iPad! Plus, this new-and-improved gadget features all the advanced functions of a modern keyboard, such as ctrl, alt, esc, and arrow keys, so your typewriter is ready to keep up with your twenty-first century demands. Made in Philadelphia. Learn more about Jack and his USB Typewriter on our blog. Jack Zylkin is an inventor who lives and works in Philadelphia, PA. After graduating from Drexel University in 2008, Jack went on to help found Philadelphia's first (and only) hackerspace, Hive76, which has flourished into a successful collective of artists, designers, and engineers. He is very interested in educating kids and hobbyists in the art of electronics, and has designed several do-it-yourself electronics kits for inventors young and old. In 2010, Jack invented the USB Typewriter as a statement about the disposable nature of modern communication--and of modern communication devices. As opposed to text messages and emails, typewriters are used to craft documents that are meant to be cherished rather than disposed of. Since first releasing his invention, Jack's USB Typewriter project has rescued over 500 typewriters from obsolescence around the world. Clean with a soft cloth, using a mixture of water and Simple Green. Do not get water on glass keys-it will seep in. An ink stained platen can be cleaned with rubbing alcohol but do not apply rubbing alcohol to any gold leaf or silver leaf surfaces, such as decals-it will remove them. If keys feel sluggish, any Teflon based oil such as Tri-Flow, can be applied to the segment (the clam shell shaped piece which holds the key bars) and any other internal hinges. Do not over oil. When storing in carrying case, make sure the wire leading to the return carriage does not get snagged on the hinges of the case. 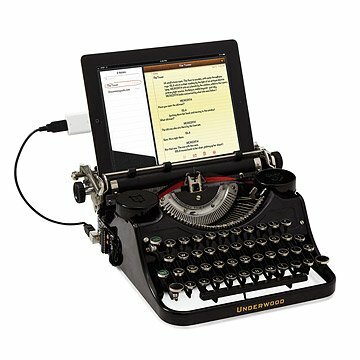 Please note, the USB Typewriter can be used with the iPad, but an additional adapter, called the "Camera Connector Kit" must be purchased separately from AppleR. "The coolest gift I have ever received!"